In what sounds like a repeat newsbit from three weeks ago, HTC lowered its outlook for the fourth quarter Wednesday, reports Forbes. On Oct. 31, when the company released third quarter earnings data, it already said the fourth quarter would be flat at best. But now, the near future looks much worse with lowered expectations from the already lowered expectations. Congratulations HTC, you have transformed yourself from an ODM commodity maker to…an OEM commodity maker. Oops. Your margins have no where to go but down–and heaven help you when the Chinese ODMs start making the same move you Taiwanese ones did. Having a huge commodity business can be a great strategic tool–if you are wielding it strategically. In deciding to retain the Personal Systems Group (PSG), HP cited among its justifications the fact that having the world’s largest PC manufacturing business means HP gets the best volume prices on hardware components that are also used to build its higher-margin enterprise products, and having the world’s largest PC distribution channels give HP ink-cartridge receptacles printers a tremendous advantage over their competitors in getting noticed by consumers. But what is HTC doing to leverage the position in mindshare and shelf-space that its success in pumping out commodity handsets gives it, other than attempt to pump out more commodity handsets? What can it do? Hint: spending $300 million on Beats Audio probably isn’t the best move. In the long term, the only companies that make any money in this business are the ones who own the whole widget. * Apple is the shining example of this as it captures the lion’s share of profits in both the PC and smartphone industries by refusing to play the commodity game, but even struggling RIM still makes money on its whole-widget sales. HTC doesn’t own the widget, and has no privileges with the Android code unless it is the one selected to make the next flagship devices (which, once Google completes its acquisition of Motorola, becomes significantly less likely). If I were HTC (which, judging by the lack of billions of dollars in my bank account, I am not), I’d see the only path out of here to be getting itself a widget of its own. I’d follow Samsung’s move and develop an indigenous OS (or, you know, buy one), and find a way to leverage my strength in the commodity Android business to get my OS spread far and wide. Dual-boot? A new version of HTC Sense that is much more an OS in its own right (perhaps some sort of “web-OS”)? 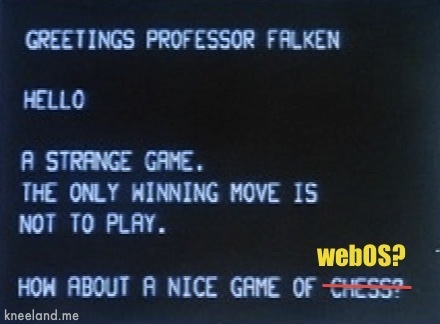 With apologies to the producers of "War Games"
*OR, at least have exclusive privileges with the part of the widget they don’t own. I think Nokia is onto something with its Windows Phone relationship, but it will take at least a year to tell. This entry was posted in business and tagged commodity, fail, HTC by John Kneeland. Bookmark the permalink. you just want to work for them….admit it!